With the uneven migration season nearing its end, I had an additional impetus to get myself back to the Merritt Island National Wildlife Refuge (MINWR) when it was reported that a Curlew Sandpiper was seen there last week. I was hoping it would hang around another day or so, and on Sunday I made my way over the causeway and into MINWR. On the way in I saw some small birds mobbing a Red-tailed Hawk on a utility pole, and some Northern Mockingbirds chasing a Fish Crow. Exciting times! Since many of the reports stated early morning viewing was very difficult, I decided to try both the Peacocks Pocket drive (which I had not done before) and then Blackpoint before circling back to Pumphouse Road. Due to the sun angle, I started down the eastern end of Peacocks Pocket and looped to the west. The sections of road in and out of Peacocks Pocket are relatively wide. If you needed to pull a bit to the side to let another vehicle pass, it’s pretty easy. The rest of the road is actually pretty narrow with very few turnouts, especially compared to Blackpoint, as an example. Luckily, I was early enough that I encountered few vehicles, and those I did see, I had plenty of time to find either a turnout or ride a slightly wider berm to get by. 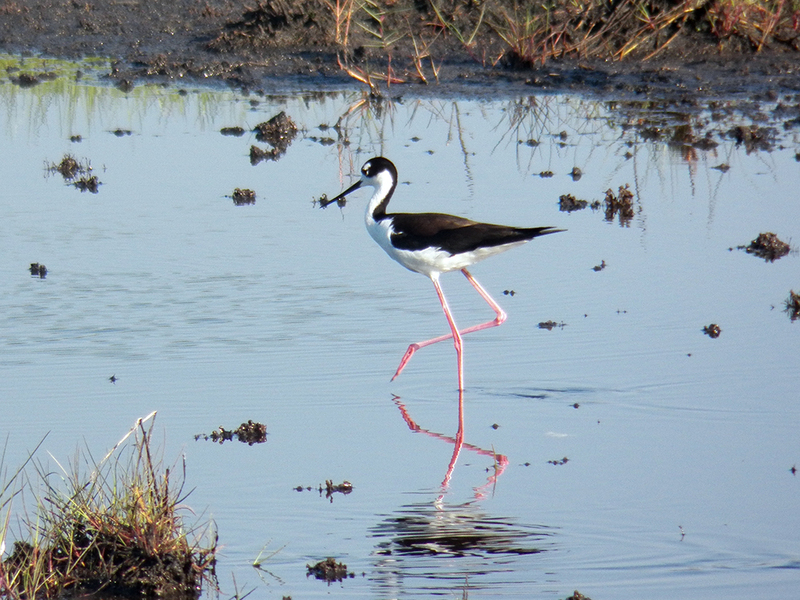 I had heard from Camille that there were nesting Black-necked Stilts along this drive, and I did see stiilts along most of its length, but they did not appear to be nesting. I don’t know the incubation period for stilts, but it was wholly possible they had finished nesting and were dispersed. If that was the case, I expected to see chicks, but at first I just saw adults. Sometimes bird names are completely pragmatic. There was the usual assemblage of herons and egrets, many of them just getting into their morning routines. One Great Blue Heron was standing, facing the sun, in an odd pose I have only seen one other time (and never quite this extreme). I know I haven’t seen photos of it before in my general searches and browsing. No, this Great Blue Heron wasn’t trying to sell watches. Many birds need to wake up their metabolism when they get up in the morning. You often see vultures spread with their backs to the sun. 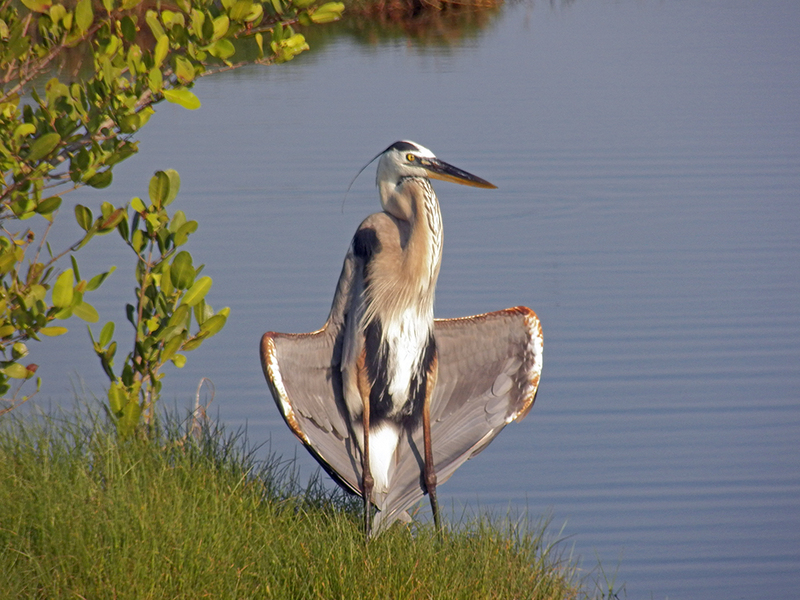 This must work for the heron, though it does look a bit funny, if we anthropomorphize. I noticed quite a few small sandpipers in the mud and shallow water. I had heard a Killdeer or two nearby, so when I first focused on some of the browner birds, I thought I was looking at a few more; however, a closer look showed only a single breast-band and much smaller bill. These were Semipalmated Plovers, and I was quite happy to see these. I have limited shorebird identification prowess, and this is the first certain identification I have of this species (that’s a long-winded way of saying it was a lifer!). Curiously, upon closer inspection of the other small birds, I saw the yellow legs of Least Sandpipers, but then the black legs and stoutish bills of Semipalmated Sandpipers! Lifer number two (I never did resolve if the slightly larger “peep” from the Orlando Wetlands earlier in the year was a Semipalmated or a Western Sandpiper). I watched the birds running about for food and chasing each other around. They let out a collective series of avian epithets when an adult Bald Eagle flew by and landed in some taller vegetation. Aside from more egrets and stilts, the blackbirds were vigorously defending their terrtories and nests for each other and the occasional large bird (I saw both Ospreys and vultures being harrased out of the area). 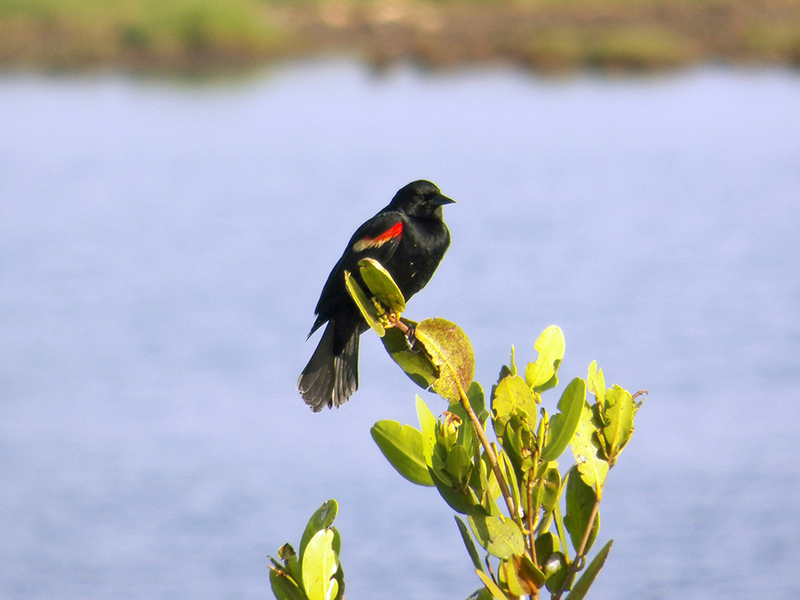 Both the Boat-tailed Grackles and the Red-winged Blackbirds were busy keeping threats away and singing, some quite close to the car. A pair of Loggerhead Shrikes really ruffled the feathers of an Osprey as they chased it so hard it almost dropped into the water! I saw it land on a small tree farther up the trail, where is stayed until I passed it several minutes later. 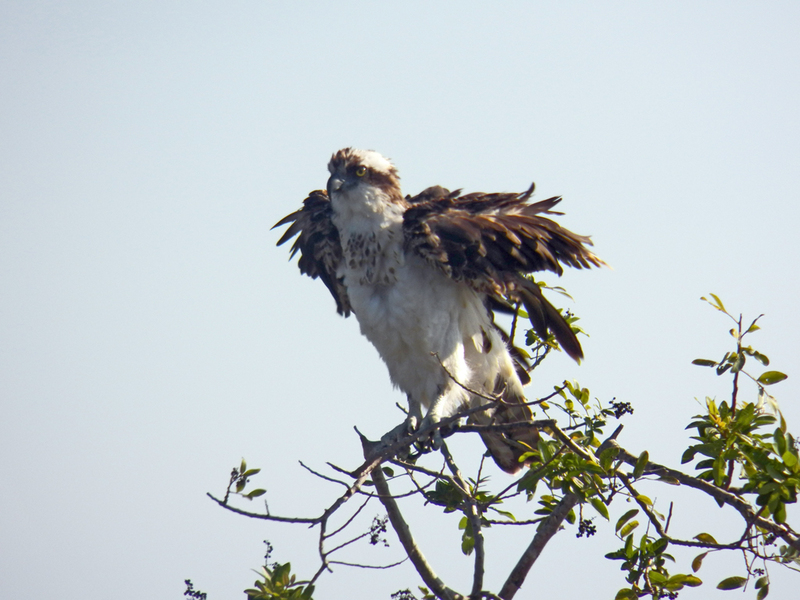 An aggravated Osprey after almost being forced into the water by a pair of hostile shrikes. Farther up the road I heard some very loud Black-necked Stilt calls, and seeing 2 adults on the road in front of me stopped and slowly got out to take a photo. Right as I closed the car door, the birds went crazy, calling loudly and one of them doing a sort of wounded-flutter just above the road, legs dangling. I realized that there must be either a nest of chicks nearby, given the faux display (similar to what a Killdeer might do on the ground, feigning injury to draw away a predator). 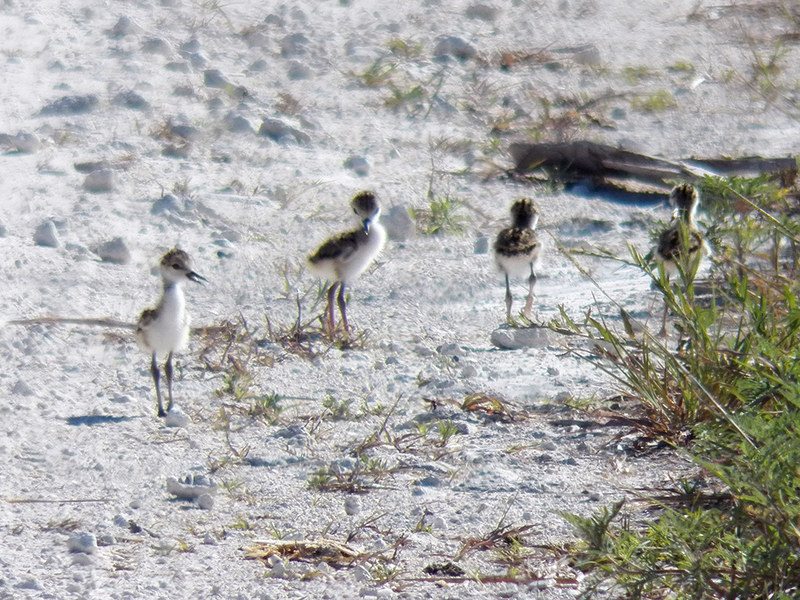 There were four stilt chicks, walking the road. The parents got really worked up and after taking a few photos, I backed off and returned to car, apologizing and letting them be on their way. 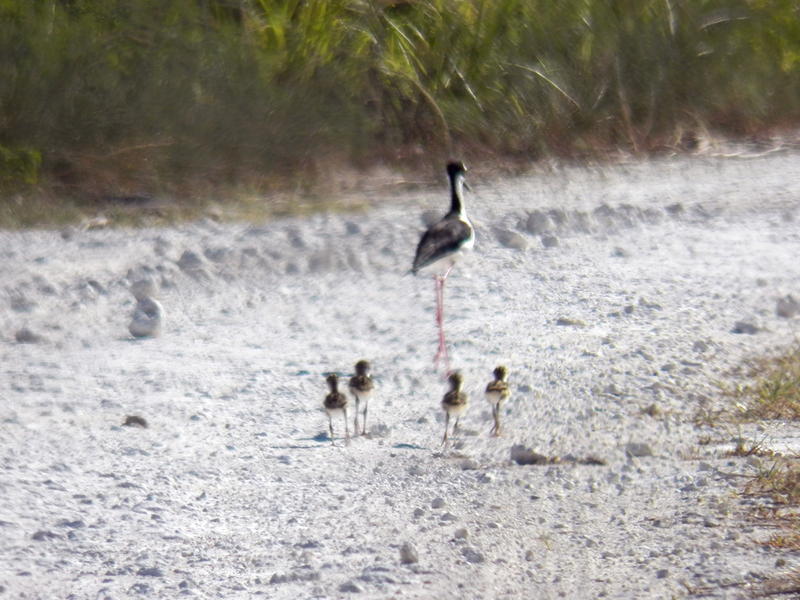 It’s very possible that many of the “dispersed” stilts I saw earlier had chicks nearby, but due to their coloring, size, and distance, I didn’t notice them. Bird activity further long the road was sparse, and as I made my way toward the other end of the road, I started to encounter more vehicles coming the other way, most of them with fishing gear visible. At this point the road widened and I came back out of the main road, just west of Blackpoint. 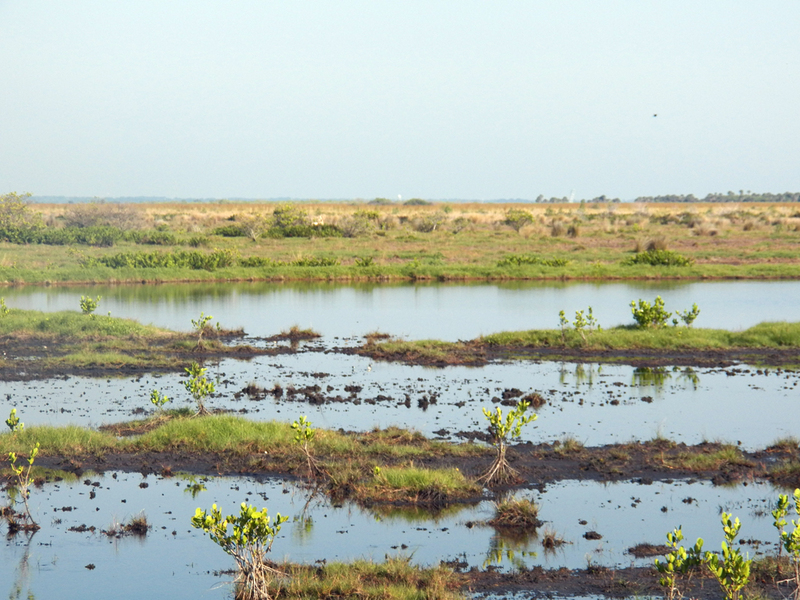 Blackpoint Wildlife Drive was quite devoid of birds, as it typical for this time of year. Except for the odd, small groupings of American Coots and Common Gallinules, there was nothing until I happened upon this Reddish Egret, dancing around to get its meal. 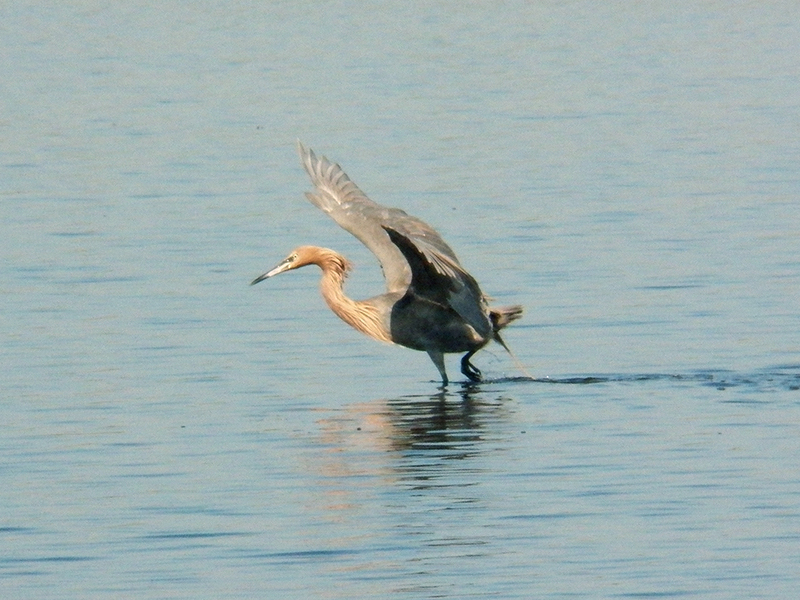 This is the same spot I’ve seen a Reddish Egret during the winter, but I have no way of knowing if this is the same bird or not. A bit further along the drive were a scattering of sandpipers and plovers, mainly Willets and Killdeer, with perhaps some other peeps mixed in, but nothing really close by to get a good look at, until this Glossy Ibis. By this point it had reached late enough in the morning for the lighting to improve along Pumphouse Road and the potential for the Curlew Sandpiper, and whatever else might be close enough to grab with my binoculars. The comments from the Brdbrain e-mail list indicated that views of the bird in question were just over a quarter of a mile down the road. As I stepped over the chain barrier onto the road I noticed a couple of birders ahead of me, both with scopes. I was clinging to a tenuous hope that maybe one of them would let me have a glance in their scope if they came across anything interesting. 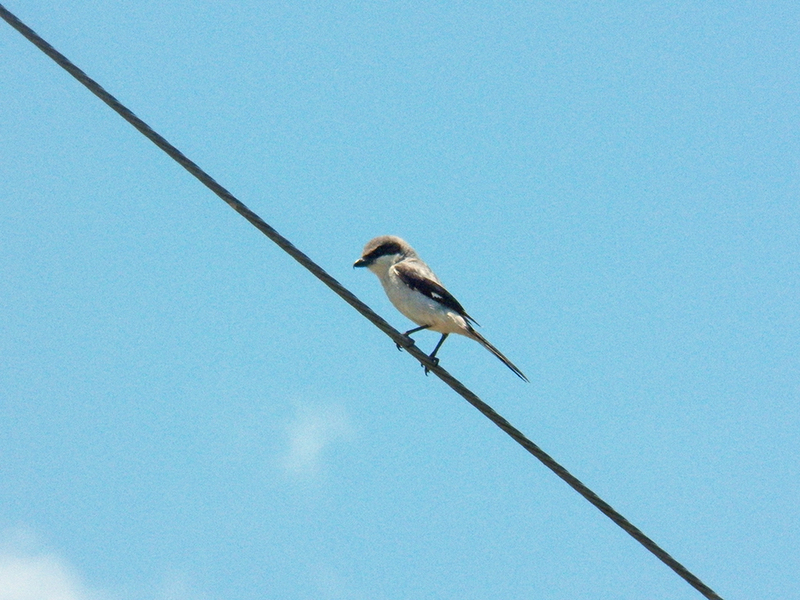 Loggerhead Shrike watching me as I entered the Pumphouse Road Loop. The first two men were decidedly cool and almost clinical, so I didn’t feel very comfortable asking for a look in their optics. They scanned a flock of mostly Semipalmated Sandpipers, looking for the Curlew Sandpiper to no avail. Another man walked in and began setting up his scope. I think I recognized him from the Space Coast Birding and Wildlife Festival; he ran the Diceandra Scrub Sanctuary trip, I believe. He was quite friendly, and I thought he might be more friendly regarding the use of his optics. Let me pause here for a short paragraph. It’s not that I feel entitled to others’ optics, it’s just that even a somewhat decent spotting scope is seriously out of my budget, and is likely to be for some time. Unfortunately, for any good looks at shorebirds or if something interesting is happening across a lake, it’s really tough with 8 power binoculars. It’s even tough with 10 power, to be honest. So the best hope that we scopeless folks have is to depend on the kindness of strangers (or any friends that are lucky enough to have procured a scope!). All three men generally agreed that the mudflats and shallow water we were looking over had dried considerably since they’d last been there a couple of days before, and that the birds were therefore farther out and harder to discern. I walked further up the road, scanning the two main groups of shorebirds just in case I caught a hint of reddish head and breast that might indicate the Curlew Sandpiper’s presence. Meanwhile, I got some good binocular looks at some of the smaller plovers and sandpipers that were venturing closer to the road. There were also some Willets, Greater Yellowlegs, quite a few Dunlins, Killdeers and even a single Piping Plover in the area. I walked back to where the men had been scanning with their scopes, but they had all departed while a few more people with scopes were coming in. I milled around and talked a bit with them about the Curlew Sandpiper and what other birds were present. I asked one couple if they saw anything of interest, would it be ok to have a look in their scopes. They said yes, they’d be happy to share, so I watched the nearer birds for a while. They finally had the scopes on some birds of interest (no Curlew Sandpiper, though) and I had a look at some American Avocets, more Reddish Egrets, a Black-bellied Plover and, a first for me, a Stilt Sandpiper. By then it was getting hot and it was past lunchtime, so I headed out. On the way, I passed some more egrets. I took brief look overhead on my way the car and saw a mix of vultures, Wood Storks, and American White Pelicans soaring on an early afternoon thermal. 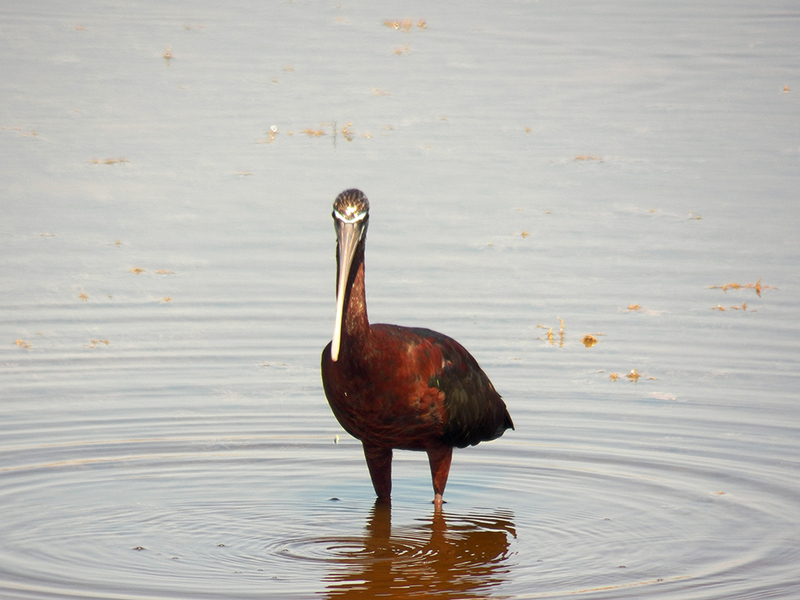 The pelicans had brown primary feathers, so I believe they were juveniles. With that, it was time to head home. It turned out to be a pretty good day, even without a Curlew Sandpiper. It turns out that no one saw it at all that day or since. Such is the way with migrants. I can’t complain, though. I saw a good mix of beautiful birds, talked with some nice people, and enjoyed a great morning out. Posted on 2015 May 13 2015 July 11 by Lonely BirderPosted in BirdingTagged Birding, birds, Merritt Island National Wildlife Refuge.